One of the common features shared by most of the bike storage solutions available here is their tendency to provide a space saving solution to your bike storage needs. The folding bike rack is no exception. It is a wall-mounted unit that will ensure your bike is off the floor and against the wall to maximize the use of space in your garage or shed. One of the nifty features offered by this rack is that when it’s not being used, you can fold the shelf up so nobody runs into it or gets hooked on it as they walk by. It also has an integrated shelf that can be used to store your helmet or biking shoes. The folding bike rack is a sturdy solid steel construction that has a durable epoxy finish to ensure you have a product that is long-lasting and can handle the frequent use of even the most avoid rider. Installation is simple and can be accomplished with the provided hardware. There is no assembly required. Simply locate where you’d like to hang your bike, and mount the bike rack to the wall. If you have more than one bike, there is also a two-bike folding bike rack that you should check out. This is an inexpensive, simple device to hang your bike on the wall. It does what it was designed to do… The simplest solution is usually the best, and this is it! 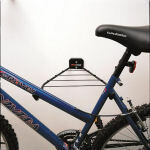 This is a very simple product, just a metal rack to support your bike so there’s nothing cutting edge about it. However, the finish is nice and it does fold in easily as stated. The fold-up is nice since you wont inadvertently wack your head against it when unloaded… Overall I’m satisfied as the price was right. Would buy again. Works exactly as advertised. It is simple to install and helps protect your bike and vehicles. The holding hooks are coated with rubber to prevent scratches. The flat area is large enough to store your shoes or helmet. When not in use you simply fold it flat against the wall. If you are looking for an inexpensive way to reduce clutter and protect your bike, look no further!